Make Your Garage Floor More Serviceable?" 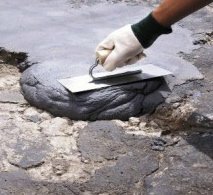 Concrete restoration is generally used where the the surface of a concrete garage floor slab is not necessarily cracked, but the surface has deformed because of improper curing at the time of original placement. This shows up as flaking and spalling as shown in the photo at the left. Sometimes this condition will go deep enough into the concrete floor slab to form a bird-bath depression that holds water, and if it freezes during the winter, adds to additional flaking and spalling. The cure for this is to effect a concrete repair using a compound that contains an epoxy resin in addition to portland cement and a very fine aggregate such as silica sand mixed with the proper amount of water. The technician in the photo above is applying the product Concrex™ manufactured by Rust-Oleum Industrial Flooring. It is for industrial use and has been utilized in warehouses that have high impact forklift traffic. It is a fine product that comes in 3 pound containers that sells for under $70.00. The aggregate is mixed with a curing agent and you need to follow the instructions on this. The application pot-time is 15-20 minutes and it cures in 3-6 hours at a room air temperature of 60-70°F. Obviously, you need to have all of your surface preparation done before mixing this product due to the pot-time limitations. If you will be filling depressions deeper than 2" then use Concrex™ Deep Fill which can be applied in thicknesses of 0.5" - 4" in one layer for concrete repair. When mixing in the curing agent, the more thorough you are, the wetter, smoother and more manageable the mix will be making it very workable. The key to successfully applying this product for a serviceable concrete restoration to your garage floor slab is in the preparation. You need to remove all loose materials and concrete dust from the subject areas where the product will be applied in order to effect a proper bond between the original concrete and the restoration product. The subject area also needs to be free of any standing water so as not to dilute the 50:50 mix ratio once the application process begins. Once cured, this product is virtually indestructible and in some cases, the concrete repair is stronger than the original concrete floor. The workability of this product is excellent and it can be feather-edged into the existing concrete surface as can be seen in the photo above. This is important when attempting any concrete repair, especially when you have limited pot-times. Garage Tips: You may want to mix only one pound of this product at a time so as not to waste it if you have never attempted the application of this type of concrete repair product. That way, if your a little slow and cautious at first in applying and working it into the existing concrete slab, you can always mix more as your pot-time runs out. Once the application has cured, you can grind this product right along with the rest of your garage floor in the event you want to resurface the finish with an additional application such as stain, concrete floor paint, or garage floor epoxy. For additional information on those garage flooring finishes visit: Garage Flooring, Epoxy Garage Floor.